Includes High temp TEG, voltage boosting circuit, strobe unit, high brightness LED, and re-useable connectors. Complete fully assembled demo kit including High Temperature TEG module, boost circuit with LED, VB Strobe unit, heat sink, and reusable connectors. The Advanced TEG Hand Heat Demonstration Kit makes it very easy to show how usable energy can be generated from very small heat sources such as the human body. Simply locate the TEG on a metal surface such as the included heat sink or metal table top, then place your hand on the top surface of the TEG and watch the LED light up in seconds. It's really that easy and simple. 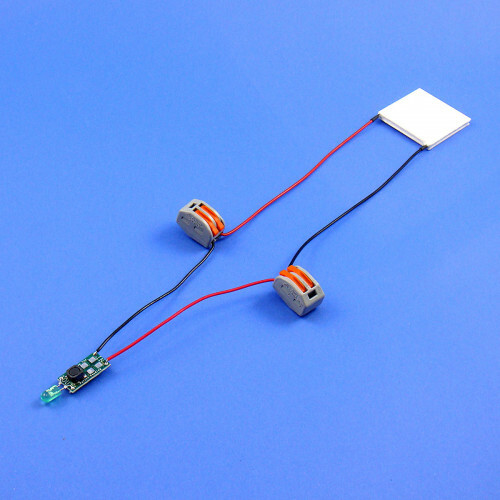 A VB Strobe board that has an LED that will flash when heat is applied to the TEG. Four reusable Wago Lever Nut connectors that allow all components to be disconnected and re-connected. No soldering needed. 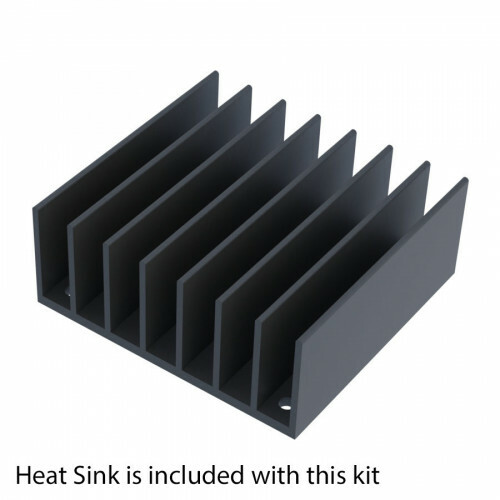 A black anodized heat sink to act as a cold sink. Instructions on how to use and some simple and more in depth experiments.